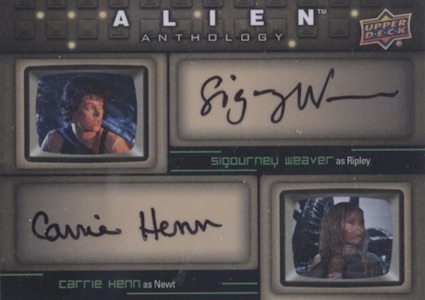 Chronicling each of the four movies in cardboard form, 2016 Upper Deck Alien Anthology looks back at the storied franchise with a comprehensive release. 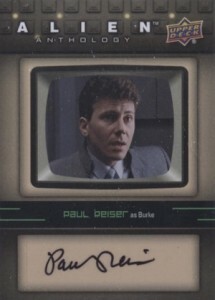 Top options include sketch cards and actor autographs. 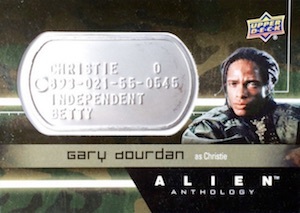 Adding a non-traditional wrinkle to the mix, replica Marine Dog Tags (1:20 packs) can also be found as well as a limited Dog Tag Autograph (1:4 cases - #/5) parallel that is signed by select actors. 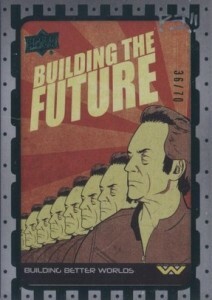 More traditional inserts each fall at 1:7.5 packs and include Character Bios, Weyland Yutani Propaganda Posters and artwork from the Legendary Encounters deck-building game. Building on the base and select inserts are one-of-one Press Plates. 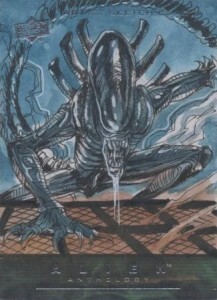 Several card products have been released for the Alien movies over the years, with the first coming from Topps in 1979. 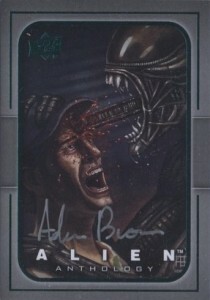 UPDATE: 2016 Upper Deck Alien Anthology is available through ePack and is the first non-sport option for UD ePack collectors. The format is the same as the regular release with five cards per pack and 20 packs per box. 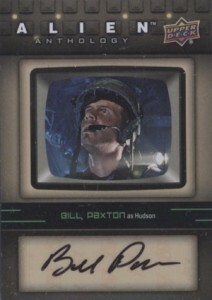 Ian Holm is an ePack-exclusive autograph option. Just like the other releases on ePack, base cards can be combined for exclusive parallels and full sets yield achievement cards. Those that collect ten of the same digital base cards can unlock an exclusive physical Red parallel and ten Red Foil parallels can be made into a physical Orange Foil. Complete a space Marine Dog Tags set (15 cards) to earn the exclusive SP1 achievement card. Complete a Base Red Foil parallel set (94 cards) to earn the exclusive SP2 achievement card. Complete a Base Orange Foil parallel set (94 cards) to earn the exclusive SP3 achievement card. The first ten collectors to complete the full set by 9/29/2016 will have the Quad Autograph added to their account with the ability to have the physical version mailed to them. Also, basic Alien packs will be among the free daily options when collectors check into their accounts. 17 cards. Ian Holm is an ePack exclusive. 10 cards. Specific artists listed below. Why is it indicated that the base set is 100 cards and also 94 cards? Are 6 cards inserts or an e-pack thing? Roman � The base set is 100 cards as shown on the main checklist. The only reference to the set being 94 cards is part of the e-Pack update info provided by Upper Deck in terms of achievement cards. It was not explained why the number is less than the regular set. Thanks, Trey. I will try to get answers from UD , but wanted to see if you guys were privy to some info. from UD here first. Thanks agin for providing all the checklists on here, it’s really a godsend for all my collections. Did UD ever release any info on why the e-pack base set is missing 6 cards? UD pulled 6 cards from e-pack that had blood/violence/gore. I get why they did it as they don’t have a filter for age, but it means that the red and orange foil cards (epack exclusives) don’t exist. You can get the silver foils from physical boxes. 1979 ALIEN UNOPENED BOX OF 36 PACKS BEAUTIFUL BOX!! 1979 TOPPS ALIEN UNOPENED WAX BOX !! !